Fluoride is a natural mineral that can be found in many foods and water. It can be used to prevent tooth decay as the mineral increases the tooth enamel’s resistance towards acid from plaque and bacteria. It can also reverse the signs of early decay by rebuilding the tooth’s enamel if caught early. Even with all of the benefits fluoride offers, many patients are still unsure if the protections outnumber any potential risks and Hinsdale Dentistry is here to set the record straight. Can you spot a fluoride fact from fluoride fiction? Research shows that fluoride helps to prevent cavities in both children and adults. Known as, “nature’s cavity fighter,” fluoride also helps to repair the early stages of tooth decay and strengthen your enamel. While fluoride can be found in toothpaste displaying the ADA Seal of Acceptance, you can also find this cavity preventing mineral in fluoridated public water supplies, fluoride gel used and applied by your dentist, and many other dental products including many mouth rinses. Fluoride is naturally present in all water sources. The level of fluoride in a specific source of water varies widely, which is why the water fluoridation process is necessary for adjusting the natural level of fluoride to the level recommended in preventing tooth decay. When used in the appropriate amount, fluoride helps to prevent cavities in both children and adults by making teeth more resilient to decay. For children younger than three years old, begin brushing their teeth as soon as they start to emerge by using fluoride toothpaste in a small amount, no more than a smear, or the size of a single grain of rice. 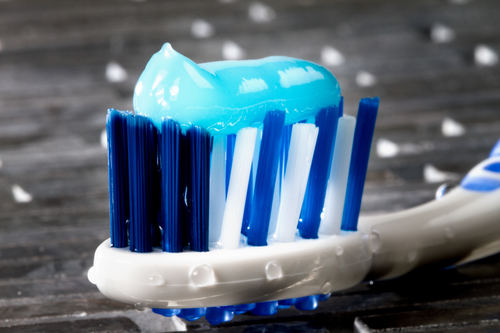 For children 3-6 years old, dispense no more than a pea-sized amount of fluoride toothpaste. Always help younger children brush their teeth thoroughly twice per day (in morning and night) and supervise their brushing to minimize swallowing of toothpaste. Studies prove that water fluoridation continues to be effective in reducing dental decay by at least 25 percent in both children and adults. Fluoride occurs naturally in water and has been recognized as an essential nutrient for healthy teeth. Not only does fluoride in drinking water strengthen teeth, but it is fortified to improve your overall health. Babies and children need fluoride to strengthen their growing teeth. The use of fluoride to prevent and control cavities is documented to be both safe and effective. Children who drink fluoridated water as their teeth grow have stronger teeth that are more resilient to tooth decay over their lifetime. Studies have confirmed that fluoridated water consumed as a young child makes the loss of teeth due to decay less likely 40 to 50 years later. The benefits of using fluoride for teeth protection far outnumber any potential risks, and people of all ages should regularly use toothpaste with fluoride to guard against developing tooth decay. It is especially important for children to get enough fluoride for teeth during the growing phase while permanent teeth are coming in. Kids from 6 months to 16 years benefit the most from fluoride in toothpaste, water, and other sources. Still not convinced of the powers of fluoride? Ask Hinsdale Dentistry how fluoride can make a difference in your smile at your next appointment.